With two new flippers in two successive years, Spyderco must be trying to change their Trademark Hole or something fishy is going on. Flippers keep gaining popularity with knife knuts because they’re easier and are in some cases faster to open. The addition of an assist mechanism or ball bearing system gives you the peace of mind that the blade will open quickly and do so completely, every time. The Domino is just this kind of knife with buttery smooth bearings, making it very fun to play with. In use, it’s like any other Spyderco – just made to cut things! The CTS XHP steel is among the best in performance on the market due a high hardness and edge holding capability. The best thing about it though, is something you cannot see; the ease at which it can be resharpened. Hard steels like D2 and ZDP perform very well until they get dull. That’s when you either have to spend an hour working on the edge or send it out to get professionally sharpened. Not so with XHP. It’s fine particle metallurgy and high chromium content makes sharpening easier while also boosting its corrosion resistance. The Chris Reeve Integral frame lock (with replaceable lock bar insert), four-position pocket clip, and carbon fiber laminate handle are just other parts of this very well manufactured product. 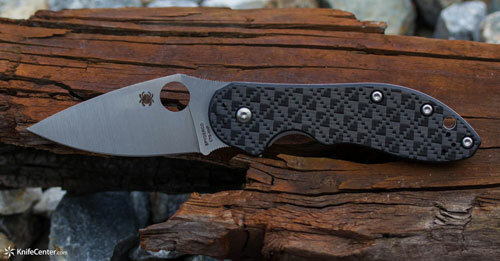 Check out the new Spyderco flipper at www.knifecenter.com. EDC is an acronym that’s been gaining momentum in popularity the past couple years and it stands for Every Day Carry. It refers to those items you don’t leave home without and always carry with you wherever you go. They can be be as simple as your keys and wallet or as complex as a bail-out-bag with hundreds of items. You can carry these items simply in your pockets or purse or can have a devoted bag/pack to hold them, depending on how much you carry. There is no magic formula for your EDC items, just a snapshot of what you need each and every day. 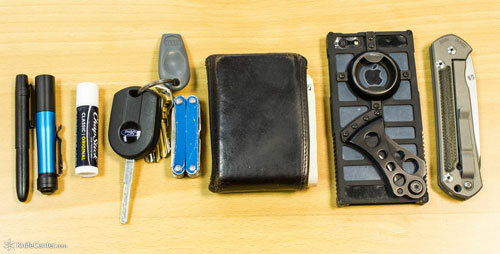 Here’s a what I’ve got in my pockets right now, much of which you can find at www.knifecenter.com. The Model 0300 was Zero Tolerance’s first ever knife, co-designed by Ken Onion and Mick Strider, and it became an immediate success in the realm of hard use folding knives. ZT has separated themselves from the competition by using only the best available materials and manufacturing stout tactical knives to some of the tightest tolerances in the industry. The handle of the 0300 is a large 5-1/4″, made from machined G10 with a titanium frame lock. It’s got great jimping for your thumb in both the forward and reverse grips, much like a Strider Knife, which is functional even with gloves on. The 3-3/4″ S30V blade features the new Blackwashed finish which is best described as a DLC (diamond-like carbon) finish that been tumbled (or stonewashed) for a non-reflective, broken-in look. The Model 0300 was such a popular design that it spawned a smaller brother, the 0350 with all G10 handles, that continues to be among the most popular knives ZT manufacturers. Blackwash is the same finish as the Acid Stonewash by Brous Blades and seems to be where manufacturers are heading for a durable, non-reflective finish on high end knives. Check out the new Zero Tolerance 0300 at www.knifecenter.com.